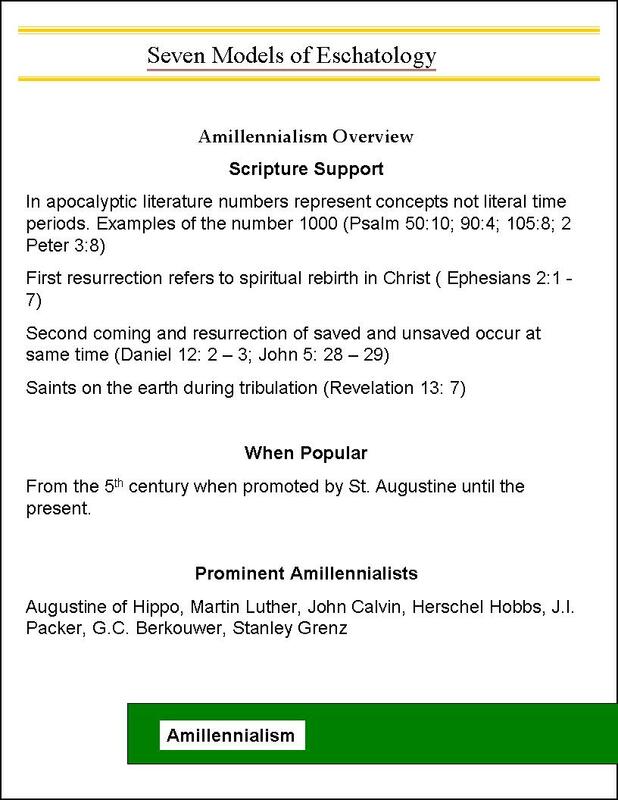 Here are the 3 outlines for Amillennialism. 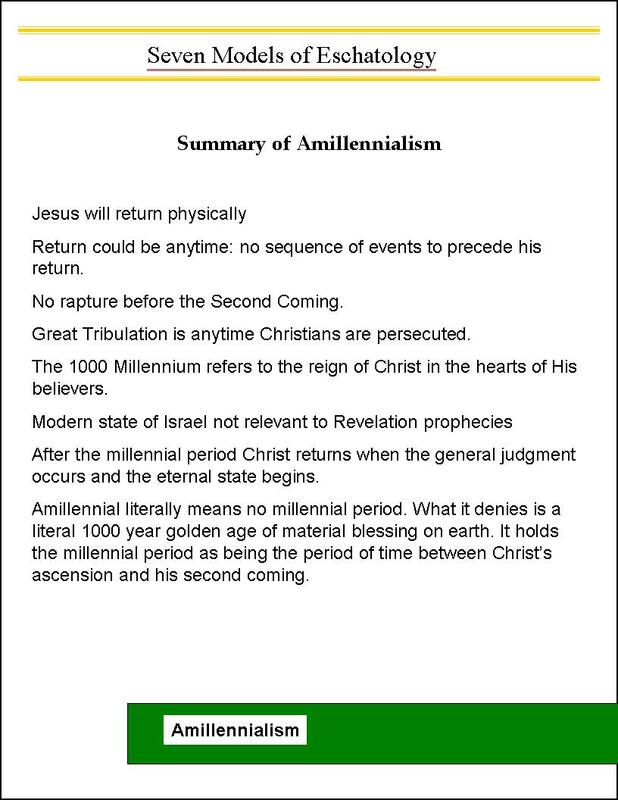 Amillennialism – belief that the millennium symbolizes Christ’s reign in the lives of his followers from the beginning of the church age till his second coming. There is no actual reign of Christ on earth. I probably should have done Amillennialism second after Premillennialism since in church history this view was the one that followed Premillennialism as the dominant view. Further to establish itself as the dominant view it had to dispatch Premillennialism and it took a hard line against it. Augustine’s Amillennialism (link on Augustine of Hippo) quickly became the accepted view of the church. Amillennialism became so accepted that the Council of Ephesus (431) condemned the Premillennial view as superstitious. There is second hand evidence that the council even called Premillennialism heresy, but that is still a debated point. The Amillennialist view contends that some of he earliest known Christians who held to the Premillennialism view such as Barnabas, Papias, and Irenaeus made it clear from their writings that they didn’t have a learned or sound understanding of eschatological scriptures. One school of thought in Amillennialism is that Premillennial origins were derived from fables about an earthly reign of the nation of Israel, where Christ would come back to earth and rule the world from Jerusalem. This is similar to the Judaic hope that an earthly Messiah would come to reign in Israel and restore the glory they knew under Solomon. At least in some Amillennialist’s schools of thought, Premillennialism is a distant echo of Jewish expectations of an earthly kingdom from which their expected messiah would rule supreme. A. John 14:27 “Peace I leave with you. My peace I give to you. I do not give to you as the world gives. Your heart must not be troubled or fearful.” CSV From an Amillennial view point Jesus is explaining the peace he gives as reconciling man’s sinful nature back to God through his atoning work at the cross. He brings peace of mind and spirit to his believers in that they are no longer separated from God. They will be indwelt with the Holy Spirit while on earth and upon death don’t go to Sheol or The Pit as it was known in the Old Testament or Hades in the New Testament Greek. Hence, the millennium is not a time of utopian peace on earth. B. Rather they enter in to the place he has prepared for them with Him in heaven John 14: 1- 3. The place Christ is preparing and will reign from is in heaven not on earth. A. This is always a challenge for scholars to comprehend the meaning of binding Satan. In earthly millennial models it usually means Satan has been removed from the earth and doesn’t cause sin or corrupt the hearts of humanity during the millennium thus paving the way for a peaceful utopian harmony among all people. B. In the models where there is no earthly millennium then it is often considered to mean not that Satan can’t cause people to sin he still can, but that his power is restricted so that he can’t stop the spread of Christianity or that through Christ we can achieve the ultimate victory over our sinful nature. A. This is not considered a literal 1,000 year reign of Christ on earth obviously since he isn’t considered to reign from earth. B. The use of the number 1,000 is purely symbolic. In spiritual matters the number 10 is considered to mean fullness or completeness. To raise the number 10 to multiples of itself such as 100 would be even a stronger endorsement of the symbolism. Thus to use 1,000 carries the meaning quite literally even further as being timeless—without end. A. This does not mean the rebuilding of a temple building in Jerusalem as is often described in the Dispensational Premillennial model. 1. Resuming the practice of temple sacrifices would be considered blasphemy towards Christ. It would say that there is another way to heaven besides through Christ contradicting Christ’s own words. 2. It would be saying that Christ didn’t pay the entire price for all sin when he died on the cross. B. References to the temple other than the Judaic structure built in the Old Testament and destroyed by the Romans in 70 A. D. are a metaphor for Christ. There is no rebuilding of the Jewish temple that has any significance for Christians or future events. 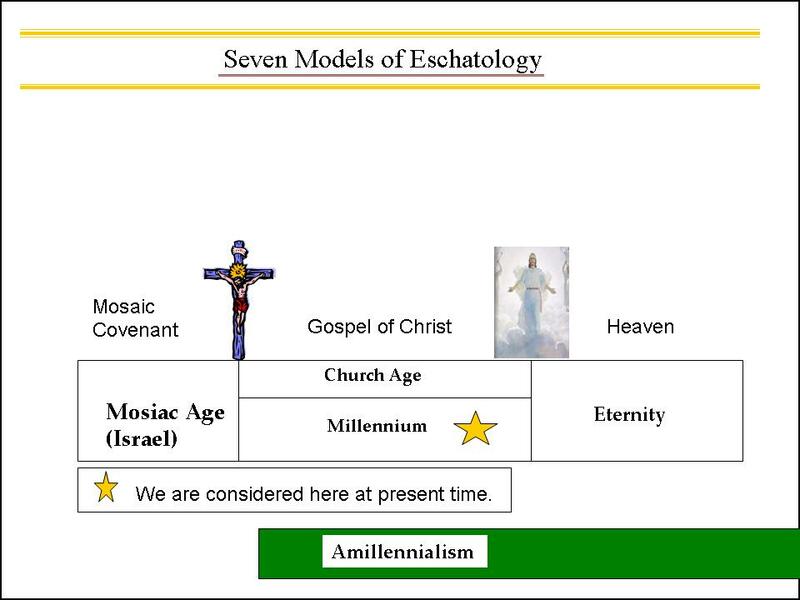 The modern state of Israel is not relevant in this model of eschatology. V. Two Ages—The Bible speaks of only two ages Ephesians 1:21 (among other places where two ages are mentioned. A. The Bible only mentions two ages—no more. When Christ ushered in the age of Christianity or the church it didn’t leave room for any other ages. B. If you had a millennial period on earth that would make three ages which is not allowed for in the bible. VI . Promises of God to Israel fulfilled. Nehemiah 9:7-8: 7 You are the LORD, the God who chose Abram and brought him out of Ur of the Chaldeans and gave him the name Abraham. 8 You found his heart faithful before you, and made with him the covenant to give to his offspring the land of the Canaanite, the Hittite, the Amorite, the Perizzite, the Jebusite, and the Girgashite. And you have kept your promise, for you are righteous. Hence: God has kept his promise to Abraham and his descents and there is no earthly kingdom coming. Amillennialism associated with Greek Orthodox Church, Roman Catholic Church, Lutheran, Reformed and Anglican churches. Good fit with Preterists views. In an unrelated matter, but included just as an interesting side note, in 363 AD there was an aborted attempt to rebuild the Jewish temple. You can follow this link to read info about the failed attempt.